DuraMAT integrates solar techno-economic analysis (TEA) to identify photovoltaic (PV) module research areas that could have the greatest economic and market impact. We develop customized lifecycle economics and finance models for PV products and systems that can be applied to a variety of research topics. From detailed, bottom-up manufacturing cost models to complete project lifecycle levelized-cost-of-energy (LCOE) and internal rate of return (IRR) computations, we're able leverage industry-relevant TEA analysis and network capabilities. Specific to DuraMat, we use TEA to quantify the costs and performance metrics for new products and practices that keep the value proposition to LCOE and IRR overall net positive. TEA can also be used to identify cost reduction pathways, and appropriate and meaningful research project milestones; and to uncover partnering opportunities between researchers and industry players. Additionally, we quantify the impacts of PV module materials substitution or reduction, the impacts of lower operations and maintenance (O&M) events and associated expenses, and the value proposition of new products that might offer improved energy yield and system reliability. Woodhouse, M.; Fu, R.; Horowitz, K.; Margolis, R. (2016). On the Path to SunShot: The Role of Advancements in Solar Photovoltaic Efficiency, Reliability, and Costs. Woodhouse, M.; Fu, R.; Remo, T.; Walker, A.; Jordan, D.; Kurtz, S. (To be published). On the Role of Reliability and Durability in Photovoltaic System Economics. U.S. Department of Energy. (2017). SunShot 2030 Progress and Goals Analysis. Accessed: June 14, 2018. Jones-Albertus, R.; Feldman, D.; Fu, R.; Horowitz, K.; Woodhouse, M. (2016). 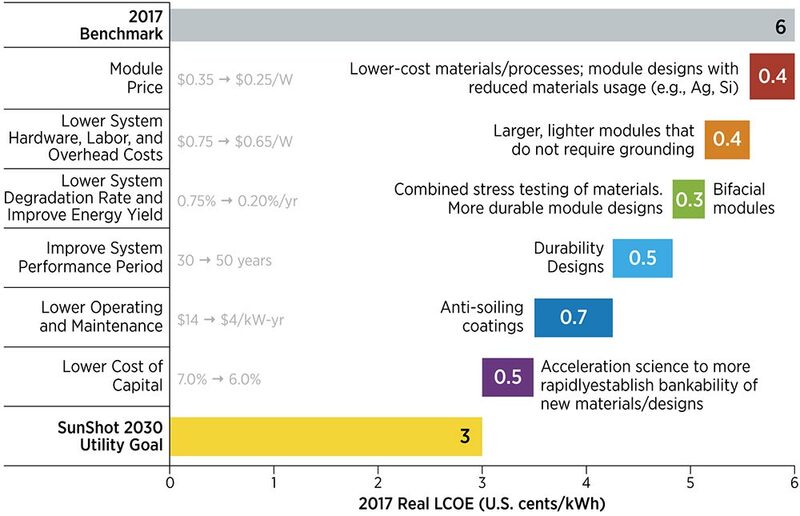 “Technology advances needed for photovoltaics to achieve widespread grid price parity.” Progress in Photovoltaics. 24(9), 1272-1283. To learn more about this capability area, contact Michael Woodhouse.